" Longjing tea view of the landscape win Linhe the show, the process refined, "Color Green, Sau Yu, Weichun, and the United States = the" four never known. The brewing tea when Babao treasures each other with the traditional tea integration, Longjing ease the bitterness, particularly fragrance Xiangyu alcohol taste. Commodities drink appreciate is the leisure drinks all ages." I know they are trying to tell me something, but the meaning seems elusive. Can you help? By the way, it made a very pretty -- but terribly weak -- tea when I used the pot. I know. I haven't posted for a long time. Life got in the way...illness, broken bones, bringing my mom from Florida to live with us now that she can't do for herself. So. Now I will try to do better -- again. I haven't been too creative during these last months, so no new "things" to show from that aspect. I did spend a month in Florida clearing out my mom's house and getting her ready to move here with us. Want to buy a very nice house? I know I am a pack-rat, but she takes the cake. 30+ years in the same house, yes, but she still had birthday cards sent to me when I was a toddler! I came home with the full intent to dump a LOT of stuff and never be a pack-rat again...only to slip on the deck and break three bones in my right leg. Now, I am finally allowed to put "some" weight on the ankle and may be walking again by Christmas. Oh, well. This week, our family is celebrating a new member: daughter-in-law Juice. After nearly a year waiting for her visa, she is finally here in the US and on March 9th, they were able to marry. She feels she is beginning a whole new life -- new husband, new family, new country. My DH and I weren't able to attend (they live on the opposite side of the country from us) but will be with them for a celebration sometime soon. It is nearly the middle of March, and mud season has begun here in New England. Or should I say, the first mud season (the other one is after the leaves have fallen...). Almost all the snow is gone and the small bits that remain are brown-tinged piles here and there. Rain falls instead of snow, but the ground is still frozen just a few inchs below the surface, so the rain cannot soak in...instead, it forms a slick layer of mud. As the temperature increases, the water will eventually defrost the soil and soak in, leading to spring. I get so impatient for the new green growth. 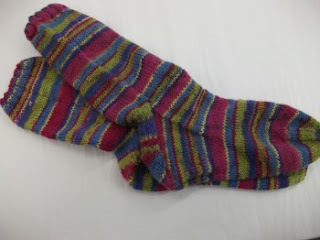 I've completed another pair of socks; I really like the effect of the self-striping yarns. And, I've started yet another pair -- one in spring shades of pale lavender, greens, pale yellow. One sock is half done. Also this week, I made a basket and have finished a quilt top to give to my mom. Since she lives in Florida, and keeps her house quite warm, I won't add any batting and will, instead, make this into a coverlet. When It is complete, I'll add a photo. 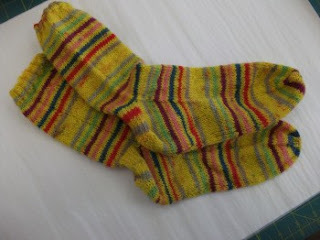 I finally finished the bright yellow socks from yarn my friends Margo and Nina gave me last spring. I have never been so slow on a sock project before. The yellow yarn is really, really bright and has stripes of red, pink, mint, blue, and taupe. While I was away, my new paint brushes, inks, and ink stone arrived from China. Today, I played around with them and did a couple of easy test pieces to see how the brushes behaved. The first one is a very brief sketch of a mountain, the second is a few stalks of bamboo to test the various sizes and two types of inks. I have not finished that piece yet. Notice my new "chop" in red at the bottom? That was a treat my son and daughter-in-law-to-be (as of March 9th!) threw in the box for fun. 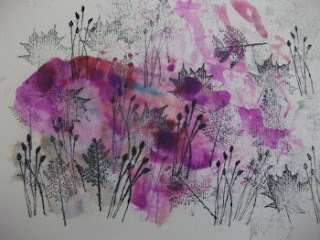 In this last picture, I was fiddling around with some leftover watercolors and some new rubber stamps. I rather liked the results. Several weeks ago, one of the email groups I'm a member of was talking about a "weird" sandwich. Everyone seemed to think it would be terrible. Contents? A sausage patty, a fried egg, two slices of bacon....enclosed in a glazed donut. I thought the sandwich might not be so weird -- after all, I actually like a bit of pancake syrup to get on my sausage or bacon. How different would this be? I told my DH, Michael, about the sandwich. He also thought it might be good. Today, we made them. I had mine without egg, he made his with. The result? Awesome. Try it -- Mikey likes it! I really hate political campaign phone calls. Tomorrow, Massachusetts is having an election to fill the vacancy left by Ted Kennedy. For the last couple of weeks, the phone has been ringing off the hook, both candidates (and their supporters/detractors) calling numerous times every day to influence my vote. It is currently 1:45 in the afternoon, and already today, I've had nearly twenty such calls. Recorded messages from Republican candidate, his daughter, his supporters. Recorded calls from the Democratic candidate, her supporters. Various pollsters. Thank goodness the election is tomorrow and this folderol will cease. Wouldn't it be nice if the "Do Not Call" List also applied to politicians, charities, and EVERYONE else that you really don't want calls from? Okay, I'll get off the soapbox. Until the next election, anyway. 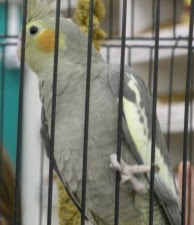 My barely-8-month-old cockatiel, Radar, just laid an egg...in my hand. She was sort of panting and acting "wierd" and I picked her up to check on her. Out plopped the egg. She seems to have recovered almost at once. She has no interest in the egg, but it is huge compared to her tiny size. Incredible! Somewhere during the last month or so, I've gotten the "pillow" bug and have made a bunch of assorted pillows. 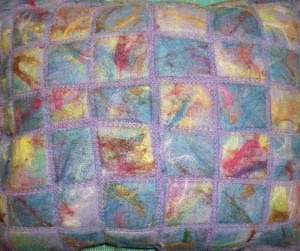 Here is a sampling: The first is a hand-felted pillow that I started about a year ago and just recently finished. 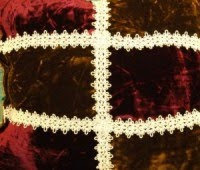 It is made from wool roving in lots of colors on a lavendar background, then decoratively stitched in an irregular grid. 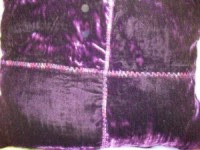 Next, two silk velvet pillows, one in purple with decorative stitching, the other in two tones of velvet with some vintage gimp added. 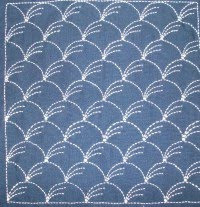 The last two are sashiko work. The one in the hemp leaf pattern is already stuffed (thus distorted in the photo, while the one in the waving grasses pattern has yet to be stuffed. It's been a busy day with the camera today. 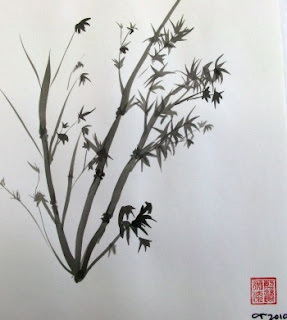 Last Saturday, I took a class in painting using the Chinese brush stoke method. 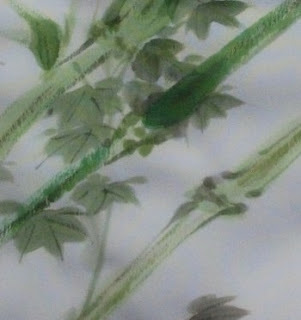 I was really delighted with the results, and had a great time in the class. 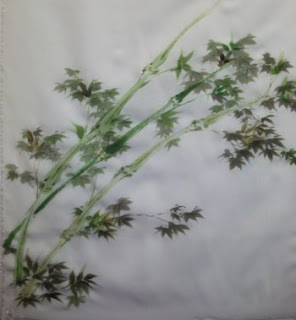 THis work is directly onto silk habotai, using acrylic paints. The second picture is a detail of some of the stems. The rain chain ice sculpture just came crashing down. It sounded like the whole studio was falling around my head. The building shook like a 7.5 Richter scale earthquake and the noise was deafening. No, the chain didn't fall. The weather has warmed up and the ice loosened around the chain. Then, it slid down the chain. Big chunks broke at the bottom as the weight pressed down, flinging huge ice logs against the side of the building. About half the length of the chain slid down, leaving the bottom 15 feet still encased in ice. I guess I will just have to wait for the next onslaught. 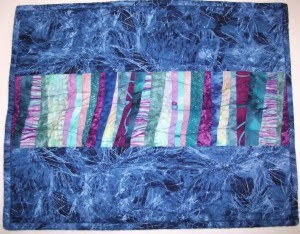 I recently joined an online quilting group devoted to using up "stash" and boy, do I need it! I am one of those quilters who cannot toss out any usable bits of fabric, so I'm always looking for ways to use little bits and pieces. I made this set 6 placemats from tiny strings of fabric -- some only 3/4 of an inch wide. 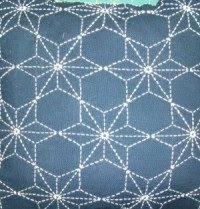 I discovered a tote containing thousands and thousands of tiny fabric triangles -- cut years ago and set aside (don't ask. I cannot remember why I did this!). I combined them and made a queen sized quilt from them, which I will eventually get a picture of when I can hang the quilt from the deck and get a good photo. 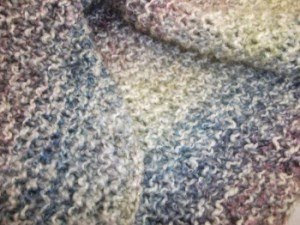 And, on the knitting side of the studio, I found a great shawl pattern and knitted it for my mom for Christmas. The soft colors are just her style. Outside my studio hangs a rain chain -- a length of chain used to channel the rain down to the ground and used instead of a downspout. The chain is long - perhaps 30 feet. In the summer, the rain flows down it as a gentle trickle, or a rushing torrent, depending upon how hard the rain is falling. 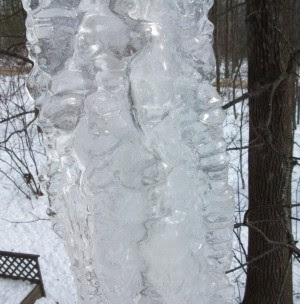 Right now, the rain chain is, instead, an ice sculpture. The chain is hidden, surrounded by the ice. The ice is nearly a foot in diameter, reaching all the way from the roof to the ground. When the sun hits it, it becomes a million rainbows rolled into one. 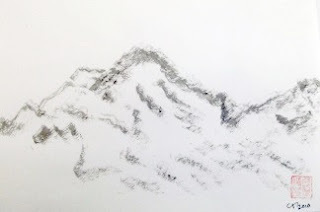 Drips of melting ice create ridges and furrows, knobs and hollows, an ever-changing form. It is spectacular. I'm getting back. I've spent a lot of the time since September in a fog, but the fog is lifting; I am getting back to my old self. The muse is back, too. 2010 will be a good year. I am an artist and dabbler living in Montana, just east of the Rocky Mountains along the Missouri River. I share my life with my husband of over 50 years, a cat, two parrots, a chicken, three koi and as many wild birds as I can attract. My hobbies are painting, paper crafting, crazy quilting, sewing, reading, traveling and just enjoying retired life.